Natural Unflavored100% PureHigh in Branched Chain Amino AcidsSupports Healthy Immune System FunctionA Dietary SupplementWhey Protein Isolate, the purest form of whey protein available, delivers all of the essential amino acids without adding significant amounts of fat or carbohydrate to the diet. In addition to providing a superior source of protein, Whey Protein Isolate supports healthy immune system function through its positive effects on glutathione production, as well as by encouraging the normal process of tissue repair. Whey Protein Isolate is a rich source of the Branched Chain Amino Acids (BCAAs), Valine, Leucine, and Isoleucine, that are necessary for the building and repairing of muscle tissue. 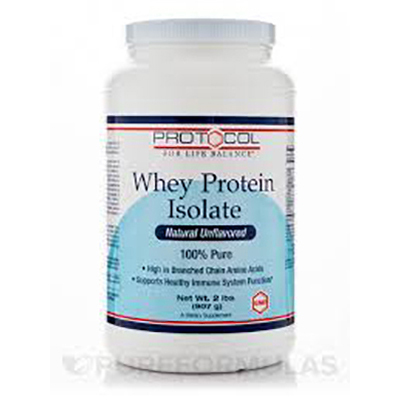 Whey Protein Isolate mixes instantly, contains no artificial sweeteners or flavors, and is easily digested.